Everyone who rides a motorcycle will get cold hands at some point. Whether you’re a beginner rider or a seasoned road warrior, you’ll eventually wish you had a pair of electric motorcycle gloves. These VentureHeat 12v Gloves would be a good fit for pretty much any type of rider which is why the price tag is higher than most on the market. If you’re the type of person who always tries to buy the best product on the market no matter what the cost is, then this is the perfect pair of gloves for you. Sure they’re a little bit expensive and you could spend less and buy an inferior product, but then you wouldn’t have the peace of mind knowing that you own the best possible pair of electric motorcycle gloves. These are my pick for the best 12v heated gloves. I don’t want to take away from some of the other 12v gloves I’ve reviewed because I try to only review high end products. With that being said, this glove has it all. It really performed well in every category. I hope you enjoy this review. These are very comfortable. I don’t really know how to put it. They hug your hands nicely without being annoying. I often find that when I’m wearing motorcycle gloves they take a little while to break in. Usually the glove wants to sit straight or open palmed and so you have to apply some pressure to wrap your hand around the handle bars. That is not the case with these gloves. They were designed for motorcycles and that’s what they do best. The glove sits naturally in an almost “fist like” position so that when you’re riding you don’t have to put pressure on it to get it to close around the hand grips. This doesn’t sound like much but it feels great when in use. They make for a really comfortable ride although that “fist like” position doesn’t do you a lot of good when you’re not riding. The palm of these gloves is made from Premium Nappa Leather and the lining is a soft polyester fleece. This no doubt helps in the comfort category. The heat covers the back of the hand and all along each finger right to the tip and the heating panels are made from hair-thin micro-alloy fiber so you won’t even be able to feel them. I actually prefer the back of the hand being heated on a motorcycle glove because then the heating elements aren’t annoying when you’re grabbing the grips. They heat the hand really well, as well as any heated gloves I’ve tried. They have three heat settings that are controlled with a button right on the gloves. They draw 2.2 amps combined which makes for a really warm pair of gloves when the heat is on. When the heat isn’t on they’re still pretty warm thanks to the 100g of 3M Thinsulate insulation. 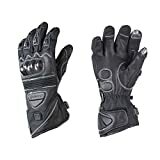 Although I’ve only used heated gloves for riding motorcycles, these gloves will also work with ATV’s, Side-by-Side’s, quads or snomobiles. I was really happy with the performance and so I’m giving them a 19/20 for comfort and a 19/20 for warmth. Most of the time when out on a ride we don’t need our gloves to be totally waterproof. Just water resistant is usually enough because we all try to avoid riding in the heavy rain. But no matter how hard we try, there’s always going to be the odd time where we get stuck in the rain. Maybe there’s only another hour to the destination and you just want to get there ASAP so you push through the rain. Or maybe you’re trying to catch a ferry or plane and you just have no choice but to ride it out. Well whatever the circumstance is, these gloves will keep your hands dry. They’re equipped with the Dintex membrane which is not only completely waterproof but also breathable. This is yet another reason why these gloves are great for any riding occasion. They also have a bit of a cuff on them so you can pull them over your sleeve and tighten them up to keep the water out. The cuff is also small enough that you can tuck it under your sleev if you prefer that. Very versatile. In this category I’m giving these gloves a 20/20. With VentureHeat being one of the biggest names in heated gloves I already knew these gloves would be high quality before I even tested them out. So it was no surprise at all when I inspected them and found them to be very durable and well built. They’re made of leather, nylon and carbon fiber and the stitching is extremely tight and strong. They look to be pretty much indestructible which is exactly what I want and need from a motorcycle glove. You can where all of the stitching is because it’s done in white. This is great because it makes it easy to see that they’ve used double stitching throughout the entire glove. The wiring that comes with it is strong and it connects to the glove nice and tight. No complaints here. The safety of any motorcycle gear is very important and that goes without saying. If you’ve ever been involved in a motorcycle crash you know how scary it is and how much damage can be done. One thing that happens a lot when riders crash is their gear comes flying off. So no matter how great your gear is, it’s very important that it can be done up tight so that it won’t come off. These gloves have a nice drawstring that allows you to get them on very snug and tight. When done up properly, they should stay on in the event of a crash. As I already mentioned, the exterior of them is a combination of leather, nylon and carbon fiber. A lot of motocycle gloves use kevlar for extra strength and protection but carbon fiber is actually known to protect better which is good news for these gloves. The carbon fiber is over all of the knuckles which is usually an area of high impact. These gloves are as safe as they come. I’m going to give them a 19/20 in this category and I just want to say that I’ve never given a pair of motorcycle gloves a 20/20 before because safety can always get better. These glove fit very true to size. Just be sure to measure your hand before you order in case you’re not sure what size you need. You should use our Sizing Guide to see how to measure for gloves. As you can probably tell I’m really impressed with these gloves. They are my favorite pair of heated gloves as I’m writing this review. I’d like to ad that these are also touchscreen capable. As you can see the thumb and index finger are equipped with material that will allow you to use your smart phone or tablet. Obviously you’ll have to pull over to do this. If you’ve never used heated motorcycle gloves before you’ve probably just used a warm pair of gloves instead. The problem with most warm gloves is that they are too thick which makes them less comfortable and gives you less control of your bike. That’s why I love heated gloves because they allow you to wear a thin glove while still getting a very warm glove. One more thing to mention is that these gloves are compatible with any of VentureHeat’s other 12v products. If you decide to buy these gloves or any VentureHeat gloves you’ll always have the peace of mind knowing that they have a great return policy just in case you need to exchange or return them. I would recommend buying them from Amazon.com or Amazon.ca as this will give you the quickest shipping and the easiest return/exchange policies.